Hi! My name is Nicholas Vespucci! I found my first stamp collection 18 years ago at a Salvation Army in San Diego and I was hooked from day one! I began to amass more collections and spent a few years researching the stamp market. I started advertising and making offers on stamp collections. I was eventually informed that my stamp collection appraisals were much more generous than the offers they were receiving from larger stamp companies and local dealers. I began to take steps toward establishing Nick’s Stamps as a worldwide stamp business! After 12 years of buying postage stamp collections, I am happy to say that we buy almost every stamp collection that we appraise. 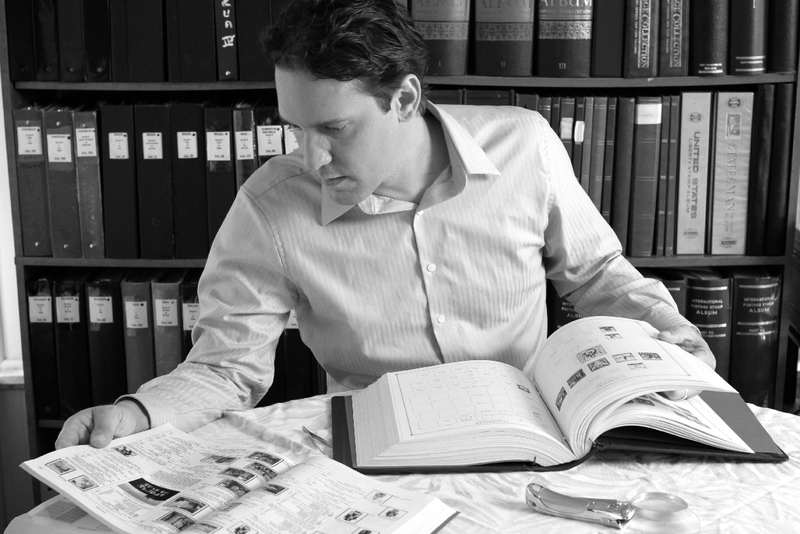 We base our stamp collection appraisals on what’s fair. We cannot always pay what customers expect or what they originally paid for the material. However, we take pride in offering the most for the collections that our customers have spent many hours and dollars putting together. we hope you would also be kind enough to share your testimony on our site as well. Simply click here, to get directed to our contact page. Although Boxing up the 20 albums was not fun, the experience with Nick’s Stamps was not only fast and efficient, but the offer was $1250 more than the offer I received from a local dealer. This made shipping the collection worth it. Nicholas was very upfront and professional. He did not play any of the typical games usually played by dealers. After a few encounters with other stamp dealers, I was very happy with the overall transaction. asset to our kids and collectors. He deserves loyal patronage. Thank you Nick! I will refer anyone needing stamps to you.! Thank you for helping me with my Estate,I was very impressed with your knowledge and service,thanks again. you are awesome!! Extremely honest and fair in pricing and all aspects. Even after the sale Nick still wants to make sure you are happy and answers questions and gives advice of all kinds! After reading about the decline in the stamp market, I was more than happy by the offer I received by this company. Nick was great. He was so professional and we really appreciated his honesty and expertise. We came across a collection of stamps from a friend and he was able to appraise them and offered more than other stamp collectors with whom we spoke. We would definitely recommend Nick to those interested in adding to their stamp collection or those who are looking to get theirs appraised. Thank you Nick; we really appreciate it. Yesterday, November 13, 2014, I had the pleasure of meeting Nick Vespucci. Part of me wants to think that we hit it off so well due to the fact that we’re both Italian. But I could tell after not very long that Nick is truly a genuine person and more than likely gets along with everyone he does business with. I’d been given a stamp collection that took five banker boxes to contain and since then had attempted to contact many local collectors to find any knowledge of value for this collection. Many, or I should say most of them didn’t seem to want to take time to discuss your collection unless you basically already knew it’s value or worth. Then if you did that would be all they wanted and you would be left with the remainder. I came upon Nick’s Stamps ad in the classified section of our local paper and called him immediately. I could tell within the first few moments that I was dealing with someone who was actually going to take the time to answer all my questions. Since then Nick and I have met and he purchased my collection at a very favorable amount. I was happy to be feel of five extra boxes to be kicking around (I was edging on the hoarder status), and I was grateful that they went to a honest dealer that being Nick Vespucci. I’m sure this will sound corny but, Nick Vespucci gets my “Stamp of Approval”. Thanks, Dina Ligari – Bakersfield, CA. I held on to my father’s stamp collection ten years, for sentimental reasons and because I knew what it meant to him. When I decided to find a buyer for it, I wanted to find someone who also appreciated the stamps. The local stamp/coin dealer was not even interested. I found Nick in a classified ad and contacted him by phone after reading his website. I told him I was not comfortable shipping the albums to him; he said he understood and that he would be in my area in several weeks. Nick came to my home and assessed my collection. He impressed me by his courtesy and professional attitude. And he didn’t give the stamps a cursory look, but took his time and turned over each and every page. I felt he made a true and just evaluation of the collection and I was pleased with his offer. I would highly recommend Nick to anyone as I believe he is very fair and accommodating. We could not have been more happy with the great service and offer we received for our stamp collection. Business was done exactly the way it was stated on their website. Professional, fast and offered almost twice as much as two other companies combined! We will definitely recommend Nick’s Stamps to anyone looking to sell a postage stamp collection! By far the best stamp dealer I’ve personally every dealt with. His descriptions are spot on and offerings always more than generous. Need more like Nick in the community. Thanks Nick!!! WOW what a surprise especially for chrismas! Thanks a reaaly beautiful stamp especially for a novice collector as myself…THANKS again to Nicks Stamps! Was a terrific experience in the sense that Nick helped you understand what your family memeber or relative had put into their collection. Also gave you a sense that you were helping others possibly complete or start their own collection thru either your donation or selling of your own family’s work of their collection. Nick never made you feel uncomfortable or that you were getting taken by someone who knew more of what you had then you did. Wish all transactions in american business could have the same sense of gratitude and pleasure as dealing with Nick’s stamps. Great collection, great price and outstanding service, he got the whole over 20 lb package to me in just 48 hours, I couldn’t believe it!!! Definitely a great stamp dealer to deal with, highly recommended. I had a very positive experience with Nicholas when it came time to sell a grandparent’s cherished stamp collection. From the first phone call through to the sale, he was professional, respectful and pleasant. Nicholas educated me on the collection and the types of collectors. It was clear he had a passion for this hobby, which made it easier to sell. I felt comfortable with Nicholas from the start. He even went out of his way to return some pieces I meant to pull from the collection. The whole process was a positive experience. I highly recommend Nick’s Stamps and wish Nicholas much success. My experience with Nick was fantastic! I had a large collection of stamps and had contacted an appraiser from the American philately society. He came out and wanted $100 an hour to look at my stamps and didn’t even know how to appraise them. I found Nick on the internet, he was prompt , personable, professional and made me A very fair offer! I would highly recommend Nick! Great guy! Many would say that mine was a modest US collection, but one with lots of mint sheets, plate blocks, booklet panes, and FDC’s– and some mint and used singles that I had enjoyed collecting since childhood. Of course, I thought the collection was worth more than the market allowed, but from our initial contact, Nicholas Vespucci took the time to discuss with me the pros and cons of selling in today’a marketplace. After deciding to sell and shipping the collection to him, he carefully evaluated my entire collection–.and even given today’s depressed market, he gave me a very fair price for the entire collection. I recommend Nick’s Stamps to any collector who has decided to sell. I had a small collection of stamps that I obtained in France. Nick reviewed a few photos and then the stamps in albums. Had nothing but a great experience. He was very helpful and clearly explained what he saw and why he placed the value on them he did. I believe Nick acted with great integrity throughout the transaction.I will do business again with Nick when I have more stamps to sell.